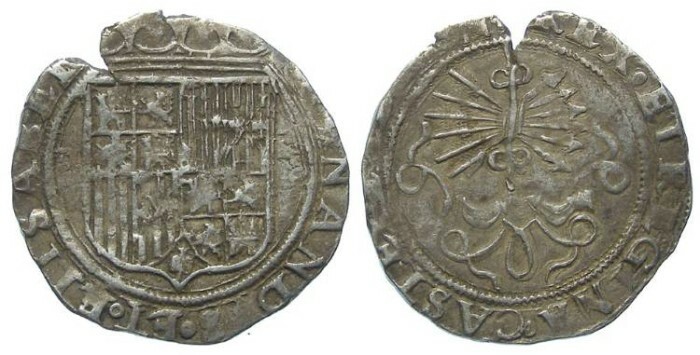 Spain, Kingdom of Castile, Ferdinand and Isabella, AD 1474 -1504, 1 real. Size : 24.7 x 25.6 mm. Weight : 3.32 grams. Grade : aVF but with a ragged area and flan crack. Obverse : Crowned shield, with FERNANDVS ET ELISABET around (the first few letters are off the flan). The mint mark symbols which flank the shield are not clear. Reverse : Cluster of arrows with an ornate ribbon above, with REX ET REGINA CASTELE LEGION (or similar, the last part is off the flan). These are often sold as the money that financed Columbus, but this type was not issued some years after Columbus sailed in 1492.